Celebrate a birthday at Falls Avenue Resort. 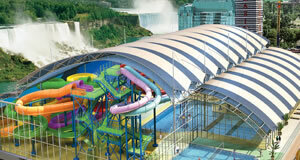 Experience all the fun and excitement that North America’s largest complex has to offer. Choices are endless, from exciting attractions to theme restaurants, we are a perfect location to play host to the party. 125,000 sq feet of water fun makes it a birthday they’ll never forget. Features: 16 thrilling slides up to six stories high, a giant wave pool, two over-sized adult only Jacuzzis, the “Beach House” Mammoth Aqua Play Area, Tiny Tots Splash Park, an outdoor sun deck and activity pool, The Beach Club food court and more, the waterpark will make any birthday a splashing success. Choice of 2 Slices of Pepperoni pizza for each guest on the Birthday Party Package. Ask about our special Cabana rates for parties. Based on availability. Birthday Party Packages require a minimum of seven people on the full party package, including the guest of honor (birthday child). Each additional person is $36.99 plus taxes and fees. All guests including chaperones are required to pay admission to enter the waterpark. Birthday cake or cupcakes to be supplied by guest – No other outside food or beverages permitted. Waterpark will provide utensils, cutting knife, plates, napkins and a sparkler.